All of the preceding was a long way of saying that I know little about earlier versions of Mx vs ATV and even less about motorcycle racing, other than what I see on late night sports channels way up in the stratosphere of cable channel numbers. 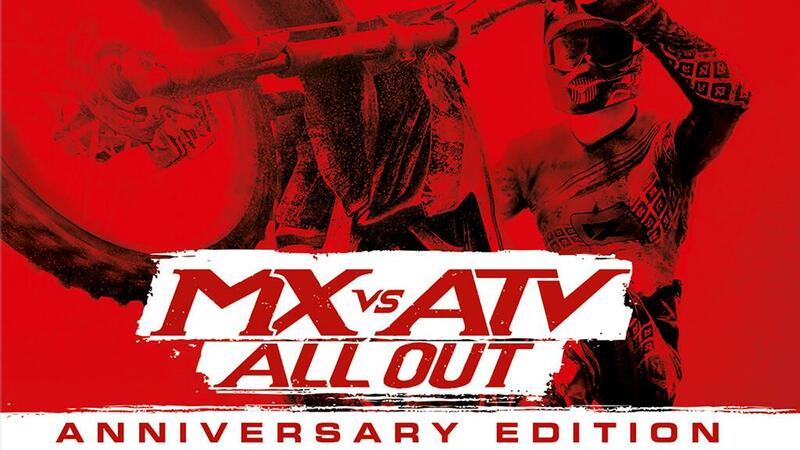 The most recent release in the series is MX vs ATV All Out - Anniversary Edition. There is a lot packed into that title, so it might be instructive to break it down. At the beginning, Mx vs ATV is just what it sounds like, unless you don’t know what “MX” or “ATV” mean. MX is short for motocross, which is basically light, stripped down motorcycles raced on dirt. There are different styles of motocross racing, but they all come from the same heritage of off road racing. ATV is a three letter acronym (TLA) for All-Terrain Vehicle, which are generally one- or two-seat, four-wheeled vehicles designed to be ridden/raced off road. 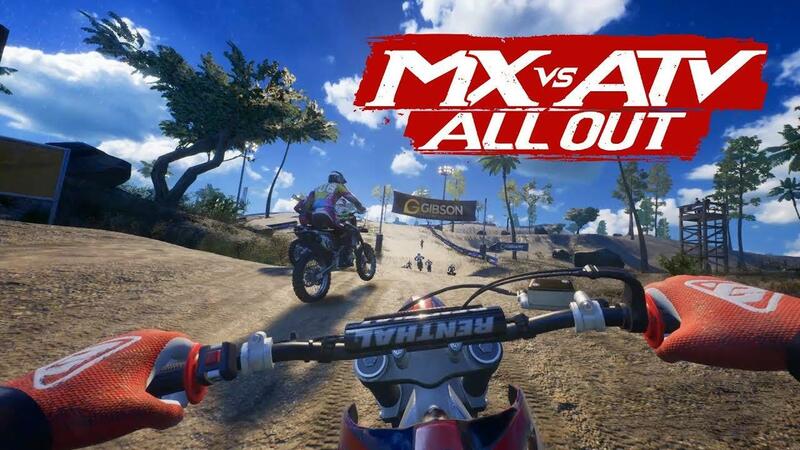 Mx vs ATV All Out was the latest iteration in the series and was released about a year ago. This year, it is being released again in an anniversary edition. The base game remains the same, but the anniversary is being celebrated by including three paid DLC modules that have come out in the intervening year. The doesn’t really narrow down what you be getting in the newly included DLC because Mx vs ATV has a lot of paid DLC. The thing about it, though, is that the majority of that DLC is branded (Yamaha, Kawasaki, Honda, etc.) motorcycles and ATVs. The three pieces included in Anniversary are a little different in that they are comprised of new race locations, rather than more bikes to ride. The three packs included are GOAT Farm, Slash Track Pack, and Hometown MX Nationals. Each includes new tracks to race on, a good number of which are quite long. Before we talk about those, it makes sense to dig a little deeper into the game itself. With All Out having been out for almost a year, there is no shortage of reviews to be found, but since it’s new to me and might also be new to you, let’s spend a little time on the highlights. 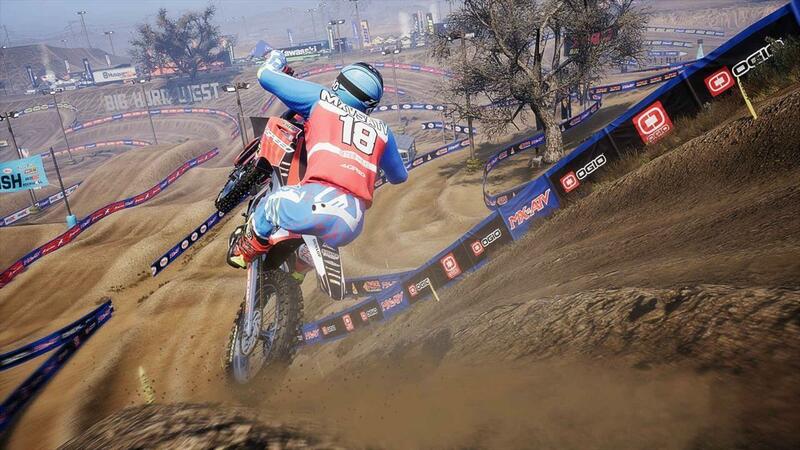 First and foremost, Mx vs ATV is heavily biased towards arcade style physics and racing. While I am a firm devotee of realism in auto racing sims, I do not insist on that in motorcycle games, the primary reason being the utter lack of commonly available controllers. For auto racing, I have a great force feedback wheel and excellent gas/brake/clutch pedals to go with it. These allow for a very realistic feel for the track and what the tires are doing in response to my butchery of it. With nothing but a game controller that provides very little feedback, physics models have to be dumbed down a bit to make up for the loss of “feel” on the controller. A true simulation if motocross would be impossible for me to control. To be honest, it’s still pretty hard, but at least more or less achievable. When I say “arcade” style, I mean things like motorcycles running into each other on the track without incurring noticeable damage to the equipment, not being thrown bodily off of your cycle after getting caught awkwardly in a huge groove in the track (although you can definitely be thrown if you run into something hard enough), being able to control the direction of the bike in mid-air, and a number of other things that make the actual riding of the bike a dangerous affair. On the other hand, there is still realism to be had in other areas, and even if the riding physics aren’t super accurate, the game does manage to make it feel like you are riding a light motorcycle on a rough track. It feels good enough, in other words, to make it both fun and challenging. And while the ruts worn into the track by other riders won’t throw you from the bike, they will slow you down if/when you cross from one to the other, causing you to fall back into the pack, or lose it entirely. The ruts are fairly easy to avoid (yet hard to stay in) early in the race, but as more laps are run, more ruts are built. Towards the middle of a race, it’s nearly impossible to avoid having them slow you down. Interestingly, towards the end of a race the path most taken by the AI riders will be wide and smooth enough to ride on almost as if it was a paved trail. 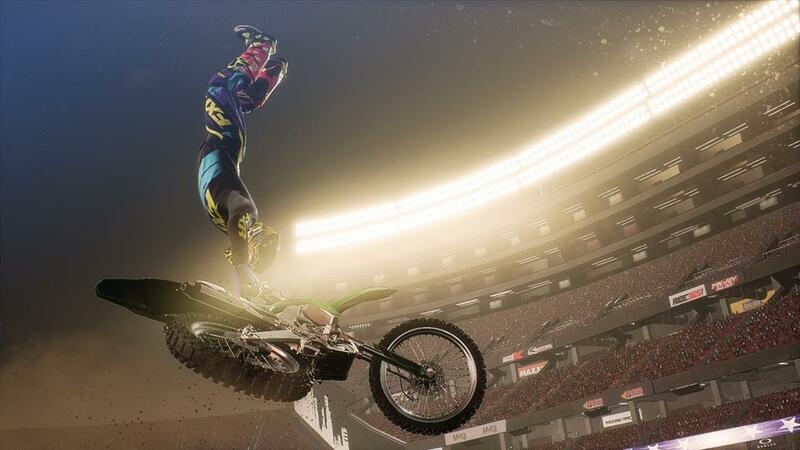 To keep it interesting, there is also a lot of variety built in with various styles of racing, such as Supercross, Opencross, Waypoint, Freestyle, Arenacross (paid DLC required), and Nationals. The difference between most of those is the length/location of the track, with the bookends being Opencross with its long outdoor tracks and Arenacross being short tracks temporarily set up in sports arenas. What they all have in common is that they’re pretty hard to do, with the jumps being the most difficult thing to get right. Well, that and dealing with schizophrenic AI riders that either fly past you like they have hidden booster rockets, or crawl along inexplicably slowly, depending, it would seem, on rapid mood swings. Personally, I prefer the local side-by-side split screen for racing, and just riding around on the wide open Freeride locations when alone. All in all, I enjoy it, although there was a fairly lengthy learning curve before I could even finish a race with the rest of the pack still visible to me. I would start well, but it only takes two falls before the pack has left you behind for good. The AI also benefits from not being subject to the time penalties that I get for falling off the bike. Your typical wreck usually starts by hitting a big jump too fast or too offline and consequently landing well off track. These occasions are worsened by the ridiculously overdone ragdoll tumbling of your avatar, followed by around five seconds of your guy lying on the track twitching in a very concerning way while the rest of the bikes roll on by. There’s no “Restart Race” button, so you have to choose between quitting the race (and incurring the ensuing load time) or riding along all alone. If you wreck early enough in the race, you might still be able to catch up with backmarkers. As far as rubberbanding, I could never tell if it was there, or if the AI was just completely inept. Either way, I pretty much always finished the race, even if I felt like the only bike in the track. Two things that helped me finish races wreck free were 1) shifting to 1st person view, and 2) switching from MX to ATV. I also tried UTV (really just bigger ATVs), but that didn’t work well in 1st person because I was blind when going over jumps, and there is a reason that blind people hardly ever race UTVs. The qualification is that I only liked two out of the three. The one I didn’t enjoy as much as the other two was the Slash Track Pack, and that was only because the track were too garish for my test. Lot’s of flamboyantly colored neon lights and jumps so extravagantly large that they must be compensating for something is not my style; I had a much reaction to the long dirt trails running throughout the local land. Goat Farm, for example, includes a track that takes over two minutes for me to lap, and that two minutes feels like twice that due to the effort required to ride it without ending up lying prone on the side of the track twitching most disconcertingly. That five-ish second penalty is the biggest gripe I have with the game. With the understanding that there should be some level of penalty for wrecking, the current means of penalizing the clumsy rider is too strict, in addition to just looking silly. I also believe the AI could be better, but I also need to mention that I saw the slow/fast dichotomy when I was playing a “Easy” level. It might still happen at the highest difficulty, but I wouldn’t have been able to see it from my position well behind the pack - those guys are fast, and they seldom wreck. I still harbor hopes of being able to keep up with them, but it’s going to take a lot of practice. That practice is worth doing because the positives with this game leave the weaknesses in their dust. 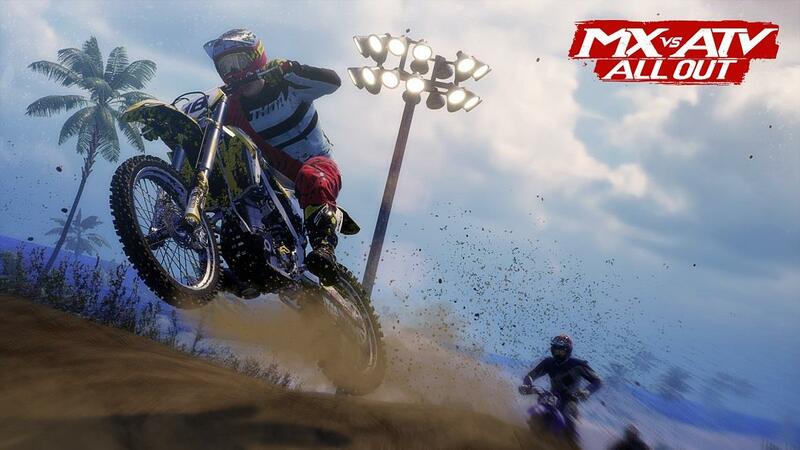 Mx Vs ATV All Out Anniversary Edition pairs an accessible, almost arcade-like (in a good way) driving/riding physics model with enough realism to make it a compelling and enjoyable way to race on the new tracks included in the anniversary edition. The majority of the new tracks are long rides through open scenery, but there are also a few shorter, indoor tracks as well for those that prefer tighter racing. 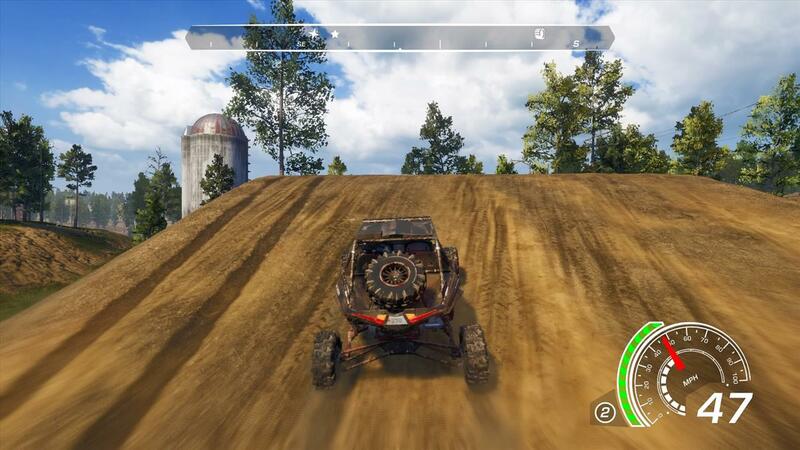 Owners of All Out that purchased it before the inclusion of the three DLC packs found in the anniversary edition would also be well advised to take a look at picking up one or two of them as they add miles of exciting and scenic trails to race on.